Welcome to HighViz.org. You have arrived at a section of the website of the Skilled Motorcyclist Association – Responsible, Trained and Educated Riders, Inc. (SMARTER). Go to Research – Conspicuity to see the research supporting the value of strategies to increase rider and motorcycle visibility. 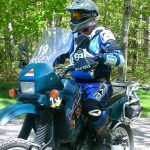 This is an introduction to the articles at the end of the page dedicated to helping motorcycle riders learn about conspicuity (a big word meaning visibility or noticeability) techniques, strategies and products. 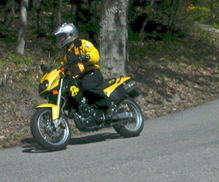 Motorcycle riders place a great value on their individuality and freedom of choice, and each rider has a riding system that’s unique – even if that means having no system at all. The information you will find in these pages allows for individual choice: visitors can choose from a number of recommendations or combine strategies and products to make themselves and their machine “stand out” in a unique way. 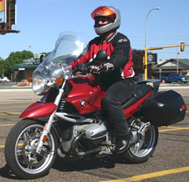 The original HighViz.org web address was owned by the Minnesota motorcyclist safety program and the material was developed by Pat Hahn, author of several books on safe riding. 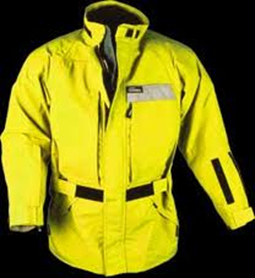 In April, 2013 SMARTER made arrangements to acquire as much of the HighViz material, as was available. The coordinator of the Minnesota program graciously agreed to transfer the ownership of the HighViz web address to SMARTER. We are proud to be able to provide this material to riders and wish to acknowledge the expert work of Pat Hahn that went into the development of this quality material and thank and the state of Minnesota and the Minnesota Motorcyclist Safety Program coordinator, Mr. Bill Shafer for their willingness to share. “Conspicuity” is just a big word meaning visibility or noticeability that is fun to say to impress your friends. Making yourself and your machine HighViz increases your visibility, making it more likely that other motorists will see you in the traffic mix or even from long distances away, which means it is less likely a motorist will violate your right of way by turning in front of you, changing lanes into your path, or stopping at an intersection only to pull out right in front of you – or, worse, collide with you – as you approach. 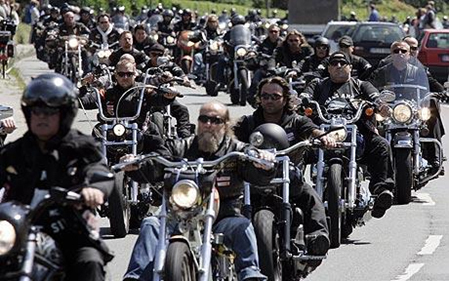 Baby-boomer bikers like to wear all black garb: black leather jackets and chaps, black boots, black novelty helmets – if they choose to wear a helmet at all. 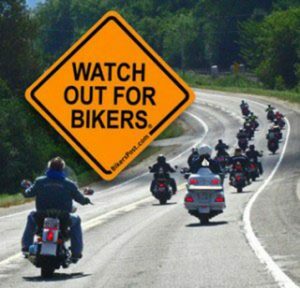 Many bikers want and expect other motorists to keep an eye out for them, but then dress in dark colors, taking little responsibility for their own safety and making it more difficult for motorists to see them. 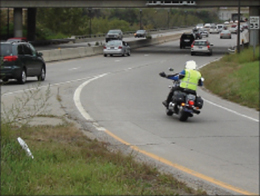 As the motorcyclist in the photo above merges into the onslaught of traffic, his wearing a bright-green vest, using hand/arm signals in addition to his electronic signals and a white helmet makes him more visible to the other, oftentimes distracted, drivers. Wildlife and combat soldiers increase their odds of survival by blending in with their background. They have camouflage coats and wear camouflage uniforms to avoid detection. 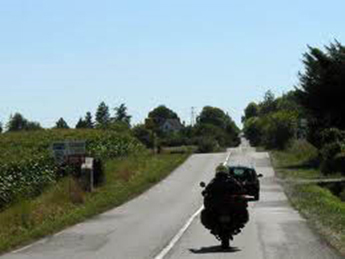 Motorcyclists who blend in with their background (like the rider above) also increase their odds of avoiding detection and being struck and killed. SMARTER riders are covered, comfortable, conspicuous, and contemporary. The bright-and light-colored gear and helmets are definitely NOT your father’s “colors”! There is more, however, to conspicuity than simply wearing bright colors. For more information see the articles below please feel free to share with others.